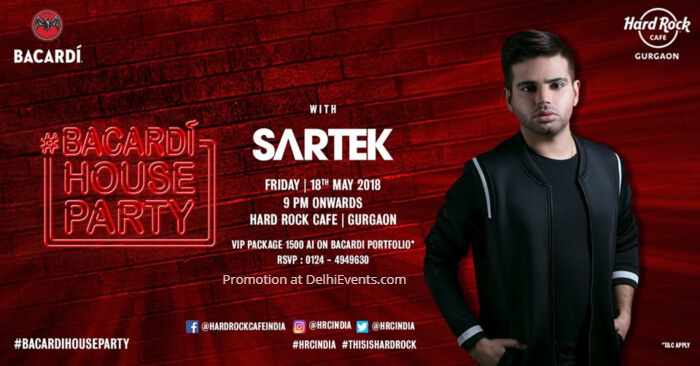 One of the most talented dance music producers in India and the only Indian to be signed to Hardwell’s legendary Revealed Recordings, Sartek is a force to reckon with. The year 2015 turned out to be a major milestone for Sartek, opening up a plethora of commendable achievements. His track "Don't Need Love" with Lucky Date; released on Revealed Recordings shot him to the centre of the industry, having become the only Indian to be signed to this prestigious label. The release of the track coincided with his performance at the World's Biggest Guest-List Party featuring Revealed boss Hardwell himself. Within the year, he also played over a hundred shows across the country, owing to his repeated claim on the Beatport Top 100 with his phenomenal tracks in the past as well as the present! 2016 seems to be year of Sartek, with Hardwell proclaiming him to be the 'next big thing'! An early release in the year – Im Trippin on Showland Music; caught the attention of his regular supporters David Guetta, Afrojack and Blasterjaxx making appearances in their sets frequently and propelling into the Top 100. With an appetite for musical prowess fit for a King coupled with enough passion to fuel his dreams and some more, Sartek has no intentions of stopping.